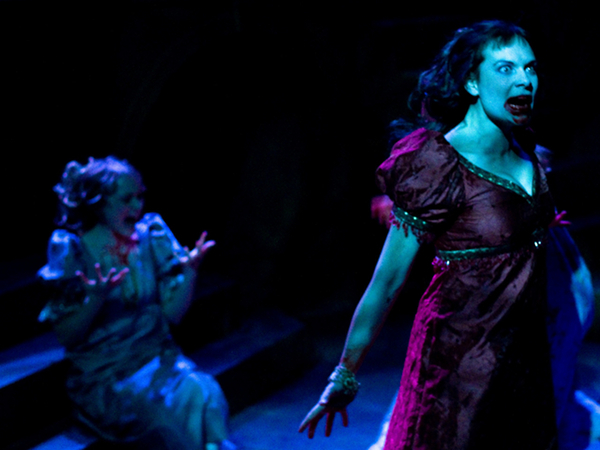 Carmilla (Michaela Petro) gets ‘er done. Carmilla doesn’t f*ck around. When she knows what she wants, she gets it — and pity to anyone who stands in her way. Twenty-five years before Bram Stoker penned Dracula, Joseph Sheridan LeFanu wrote a graphic novella entitled Carmilla, featuring a powerful leading lady vampire who seduces beautiful, helpless women, nibbles on their necks, and enslaves them for eternity. Aly Renee Amidei was so seduced by LeFanu’s novel, she adapted it for the stage, and the result is mixed. WildClaw‘s production is thrilling one moment, plodding and amateurish the next, with flashes of horrifying mixed in. The best thing this production has going for it are the two lead performances: Michaela Petro is blood-curdlingly perfect as the title role, and Brittany Burch is all doe-eyed naivety (with a touch of inherent street smarts) as Carmilla’s latest conquest, Laura. Together, they flare up the stage with their dangerous attraction. Whenever these two ladies take a back seat in the storytelling, however, the show sags — mainly because the ancillary characters are far less interesting. And why does Laura have two governesses? Excess information muddies an otherwise seductive (and bloody!) story. Mikhail Fiksel and Scott Tallarida’s sound design and original, heart-pumping compositions do an effective job keeping the momentum going, even when the plot seems to screech to a halt for a late and long act-two exposition sequence. And Alan Donohue’s multi-tiered, multi-functional set suggests a dark, secluded manor one moment, and a fog-filled mausoleum the next. Next Post Finger lickin’ good.